Plantagon Breaks Ground on its First 'Plantscraper' Vertical Farm in Sweden! Plantagon Breaks Ground on its First ‘Plantscraper’ Vertical Farm in Sweden! 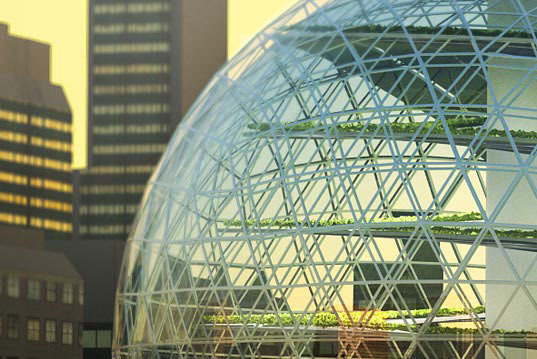 Several years ago a Swedish-American company called Plantagon unveiled plans for a series of massive skyscraper greenhouses that stood to transform urban farming in large cities. While the spiraling vertical farms seemed too good to be true at the time, Plantagon broke ground on its very first vertical farm a few weeks ago in Linkoping, Sweden! The "Plantscraper" will grow and supply fresh vegetables while creating solutions to some of the most vexing city pollution issues. The design that was finally decided upon for the first Plantagon is no longer a sphere but an elegant tower - click through our gallery to see it. Plantagon seems to have traded in its initial geodesic dome design for a sheer tower that both contains and showcases the plants growing inside. This prototype building will be called the International Centre of Excellence for Urban Agriculture, and it will be a place for scientists to test new technologies aimed at improving urban farming. Inside the massive glass walls, vegetables will be grown in pots and then transitioned to trays positioned around a giant central helix. The plants grow as the trays slowly migrate down the central core and are ready to be harvested once they reach the bottom. Plant residue and manure will be collected along the way and transformed into biogas to run the heating and cooling systems of the greenhouse. Scientists want the vertical farm to not only grow food but also help in developing sustainable solutions for energy, heat, waste, and water issues of daily city life. Construction on the company’s first enormous vertical greenhouse is expected to take 12 to 16 months. I have visited plantagon website and associated urban agriculture and could not find any reference to Permaculture, a now mainstream to be movement which is doing this for years : bring organic agriculture to cities ... am I missing something ? Wouldn't it be logical to cross expertises between building architects and permaculture architects ? Ecologically Arrogant. An architectural response to a horticultural problem. I think it is a great idea for highly urbanized cities with land scarcity,each building also should have vegetable organic farming. It's beyond a "neat" idea and right on to brilliant! By using vertical growing, SEVERAL square feet will be put into one square foot of floorspace, and many floors per square feet of ground, so it's an exponential development. Considering the cost and carbon footprint of bringing fresh vegetables up from the other hemisphere, this is VERY commercially viable. BRAVO! It seems like a neat idea, but the cost per square foot would make any food grown not viable for market. 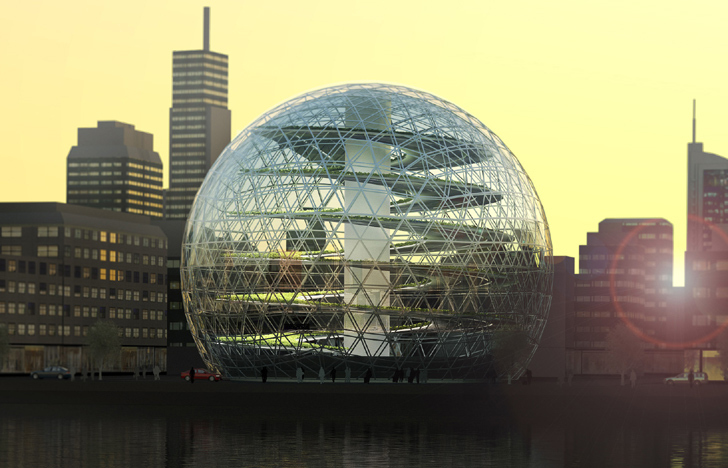 Plantagon seems to have traded in its initial geodesic dome design for a sheer tower that both contains and showcases the plants growing inside. The prototype building will be called the International Centre of Excellence for Urban Agriculture, and it will be a place for scientists to test new technologies aimed at improving urban farming. Inside the massive glass walls, vegetables will be grown in pots and then transitioned to trays positioned around a giant central helix. The plants grow as the trays slowly migrate down the central core and are ready to be harvested once they reach the bottom. Plant residue and manure will be collected along the way and transformed into biogas to run the heating and cooling systems of the greenhouse. Scientists want the vertical farm to not only grow food but also help in developing sustainable solutions for energy, heat, waste, and water issues of daily city life. Construction on the company's first enormous vertical greenhouse is expected to take 12 to 16 months.